The Department for Education has changed its evidence requirements for applications for the Disabled Student’s Allowance (DSA; for higher education students). Dyslexia/SpLD Reports undertaken at any age will now be accepted for the purposes of a DSA. Please note that Form 8 Access Arrangement Reports are not acceptable as these are not full assessment reports. Have you considered how developing the most key frontline resource – your Teaching Assistants (TAs) and Learning Support Assistants (LSAs) – could improve even further your students’ outcomes? How can we maximise Teaching Assistants skills to help those with Special Educational Needs (SEN) with CPD? In November 2016, a report published by the Education Endowment Foundation (EEF) entitled ‘Make The Best Use of Teaching Assistants’ highlights that since 2000, the number of Teaching Assistants in English mainstream schools increased from 79,000 to 243,700. The rising number of TAs can be explained by a will from both primary and secondary settings on how TAs can work alongside teachers overwhelmed with the workload, in particular allowing teachers to be able to spend more time with low attaining children and those with special education needs and learning disabilities. 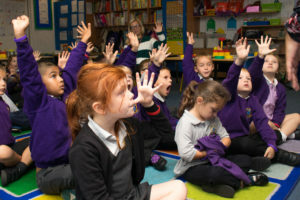 The EEF report is in line with The Professional Standards for Teaching Assistants guidelines published the same year to raise awareness on how Teaching Assistants (TAs) CPD can help implement effective and inclusive practices in schools. What are the benefits of joining the Dyslexia Action CPD Courses for Teachers? Support from a team of specialist tutors. On completion of one of the above Pathways, participants can progress to the Level 5 Certificate in Strategic Teaching Support (DACRT60) a specialist teacher training course. This level 5 Certificate course is the second part of the Diploma qualification and provides an introduction to a structured specialist teaching programme that can be used in school or college settings or with individuals of any reading age in private practice. When can I join your CPD Programme? CPD courses for teachers run six times a year. Our next intake will start on 8 May 2019 so if you are keen to register with us, please apply online here by 24 April (if pay later/invoice required upfront) or by 1 May if paying by credit/debit card.